The most common pairings in spanking art and fiction. In spanking art, the term pairing describes the genders of the spanker(s) and spankee(s) in an artwork or story. These can be put in places such as the subject line of a posting, the name of a file, or next to a link. They help other fans to find or to skip over pairings they like or dislike. The most common abbreviation scheme is to use the letters M and F to signify "male" and "female", respectively, and a slash to separate spanker(s) from spankee(s). The letters left of the slash signify spankers, those right of the slash signify spankees. In addition, capital letters can be used to signify adults and lower case letters to signify minors. For example, F/m means that an artwork or story features an adult female spanker and a minor male spankee—in other words, a woman spanking a boy. F/F illustration by Herric for French novel L’Infernale fouetteuse (c. 1930s). 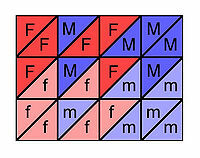 Variations of this scheme are possible to accommodate variants, for example MF/f or M/ff. In artwork, these will mean that the work features two spankers or two spankees in one picture. In literature, it means the work features two distinct spankers or spankees sometime in the narration, not necessarily simultaneously. X can be used to stand for a person of unspecified gender. So X/f indicates that someone spanks a girl, but does not indicate whether the spanker is a man or a woman. It is also possible to omit one side completely. For instance, /f can signify a girl spankee without a spanker being present, such as a girl who is alone in a room prior to or after her spanking. Another notation variant, which is described on the soc.sexuality.spanking FAQ, is to introduce a third age class between child and adult. In this variant, 'f' and 'm' are taken to mean a young adult or teenager, and the letters 'b' and 'g' are introduced to signify a pre-teen boy or girl. So in this scheme, for example, F/f would mean a woman spanking a young woman or teen girl, while F/g would mean a woman spanking a pre-teen girl. This notation variant is not used on the Spanking Art wiki. Another notation variant use the plus '+' sign to denote an older member of the group such that 'f+' or 'm+' would denote a teenager and 'M+' or 'F+' significantly older adult. 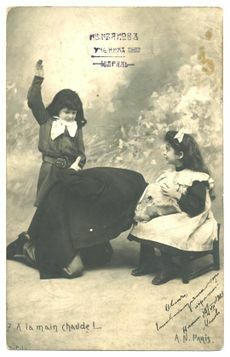 A rare example of an m/M spanking image (the child who spanks may look like a girl but is actually a boy). French postcard, c. 1900.